As a Non-Vessel Operating Common Carrier (NVOCC), you have customers who expect every transaction to be seamless. That's why you need more than just a chassis provider. You need a full-service partner who will give you full visibility to your customers' cargo, and exceptional customer service at a lower cost. DCLI offers you a transparent, reliable, and cost-effective solution that’s critical to your business. We not only provide you with well-maintained chassis, we give you accurate tracking information and allow you to improve your cash flow through shorter billing cycles. Download our Direct Billing guide to learn more about how DCLI can help you take control of your chassis usage. 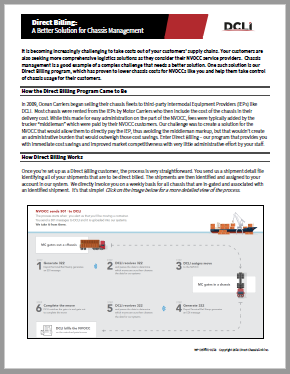 With DCLI, you have a supply chain partner you can rely on.